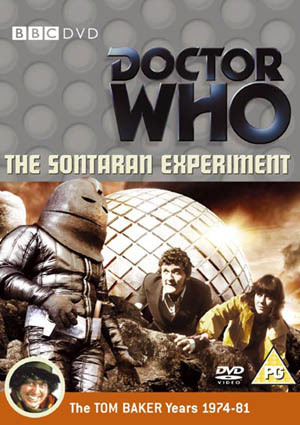 Tom Baker's THE SONTARAN EXPERIMENT (a two-part - 25-minutes per part) is another classic from the halcyon days of DOCTOR WHO (1975), co starring Elisabeth Sladen and Ian Marter. And it is a unique production being one of just a handful to be completely filmed on location (and not in a studio). The single disc (RRP £12.99) is the first of a new generation of DVD releases that will have "limited extra content" (hence the cheaper price) and could see the likes of THE AWAKENING (1984), BLACK ORCHID(1982) and THE KING'S DEMONS (1984) released in quick succession. The (very nice) David Tennant fan site has published relaxed photographs of Tennant attending the V FESTIVAL (UK music festival), alongside Billie Piper (who, according to the site, got locked inside a Port-a-Loo). 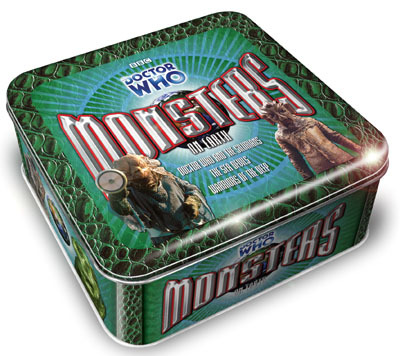 DOCTOR WHO - MONSTERS ON EARTH audiobook boxset will be released on 6 November (RRP £45.00). This will feature Jon Pertwee's DOCTOR WHO AND THE SILURIANS (linking narration by Caroline John), THE SEA DEVILS (linking narration by Katy Manning) and Peter Davison's WARRIORS OF THE DEEP (linking narration by Janet Fielding). Bonus features include interviews with each of the linking narrators, and a look at real-life sightings of mysterious sea creatures! 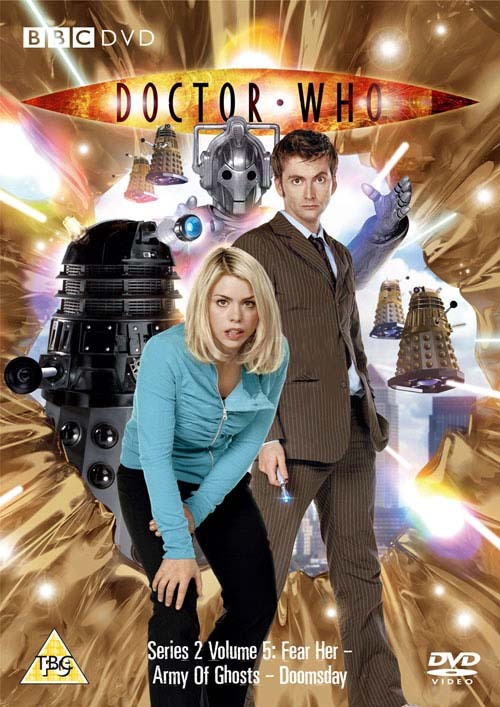 According to THE MIRROR, DOCTOR WHO Executive Producer, Russell T Davies had secured a commission for a second spin-off series based around Rose Tyler's work for TORCHWOOD. BBC WALES (INFORMATION PRESS OFFICE) Officially confirms that Freema Agyeman will appear in THE RUNAWAY BRIDE, alongside Catherine Tate. Of course, Billie Piper will not. 14 AUGUST 2006 | SERIES 4 | Tennant vacating..? With the filming for SERIES 3 underway, THE PEOPLE newspaper reports that David Tennant is in the centre of a TV (and film) bidding way between the BBC and ITV. The success of DOCTOR WHO has seen Tennant's cachet at a high and could be seen to be a serious loss for the BBC if he abandons the Corporation's flagship drama series. Tennant, upon taking the role of the Doctor, has said that he would like to play the character for several years so a decision now to jump time-ship would be a kick in the teeth for the millions of children watching the series. However, this speculation (including Russell T Davies openly acknowledged option to "take a back seat" after SERIES 4 - though contractually he will have to "approve all storylines") will spark a renewal of interest by BBC FILMS to produce DOCTOR WHO - THE FEATURE FILM (co-scripted by Davies and Steven Moffat) before Tennant leaves. The Doctor has a son, and will be the dramatic device in order to continue DOCTOR WHO after the lead character has finally died (i.e. his 13th body dies). The Face of Boe will reveal this next July. How will DOCTOR WHO purists take this? Of course, the Producers could just find a power-source, like the Traken Source (THE KEEPER OF TRAKEN - 1981), and re-energise the Time Lord. Filming for SERIES 3 has begun, with David Tennant (sporting a new suit) and Freema Agyeman (as medical student Martha Jones). THE SUN has the first photo of the new TARDIS team. Link to THE SUN - see far right. "return of a CLASSIC SERIES alien - not yet seen in the NEW SERIES"
Releasing on 30 October 2006, DOCTOR WHO respected guru, Gary Russell's DOCTOR WHO THE INSIDE STORY will be this years "must have" (along with SERIES 2 - THE SHOOTING SCRIPTS). RRP £12.99. 224 pages detailing the regeneration of the series & brand since the 2003 announcement by BBC ONE. 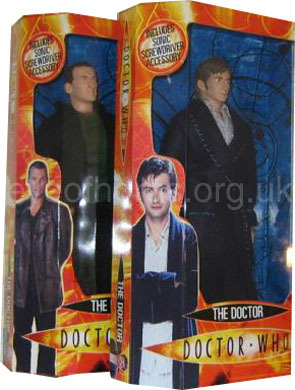 Question: if the book covers series 1 and 2, why is Eccleston not featured on the cover? DOCTOR WHO viewers might believe they've seen every photograph, read every interview, know every fact about the latest incarnation of BBC TVs science fantasy series DOCTOR WHO, but this book will set out to show them just how much they've missed. 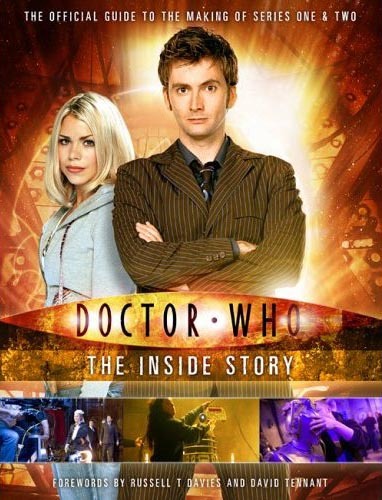 With pre-production drawings and paintings, countless behind-the-scenes candid shots, comments and opinions from everyone involved in the making of this exciting, award-winning programme, THE INSIDE STORY is exactly that an insiders scoop on the how, why, who and where of all things DOCTOR WHO. 6 AUGUST 2006 | MERCHANDISE | Official? It's a compliment but these dolls have fooled a lot of people (including EOH. Not that difficult, really!). 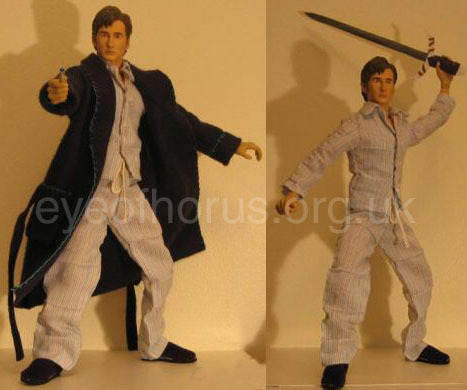 Not officially licensed through CHARACTER OPTIONS, the items have been reported to BBC ANTIPIRACY. Please, buy only licensed product. There are so many "homemade" products out there (mousemats, fridge magnets, wall clocks, snow-globes, TARDISODES on disc, even THE KEY TO TIME BOXSET on Region 2 DVD etc), so beware! Don't waste your money, and report items to BBC ANTIPIRACY. DOCTOR WHO NEW SERIES David Tennant's VOLUME 5 contains FEAR HER, ARMY OF GHOSTS and DOOMSDAY. The DVD is released in September 2006. Pre-order for £8.89 from SENDIT.COM (see link below). 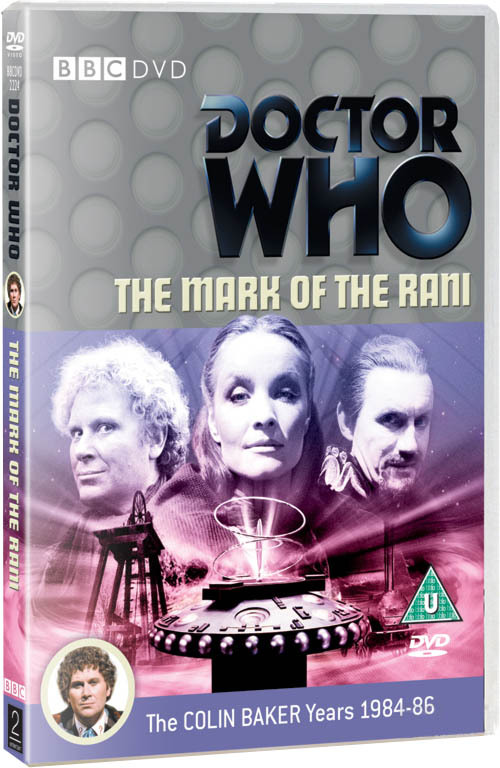 DOCTOR WHO CLASSIC SERIES Colin Baker's THE MARK OF THE RANI pitches the Doctor against two 'evil' Time Lords, the Master and the Rani. Beautifully directed by Sarah Hellings, this story is like Marmite; you'll love the historical quirkiness and location filming or you'll hate the rubber tree that comes alive and the hammy acting of Kate O'Mara. Pre-order for £10.89 from SENDIT.COM (see link below).